Now it’s time for Beethoven. Not only is this highly acclaimed quartet embarking on a three year journey to perform the complete cycle of Beethoven string quartets, but it is also inviting the public to share the experience with them via a dedicated interactive website, supported by the Borletti-Buitoni Trust. players are willing to share their immersion in study, analysis and discovery of Beethoven in a bid to demystify both the music and how they are preparing for this huge undertaking. As well as regular blogs, recordings, video diaries of coaching sessions, rehearsals and concerts and an interactive forum (Your Beethoven), there will be contributions from seasoned professionals of the string quartet world. The Lindsay Quartet’s Peter Cropper, who has played each quartet more than 200 times over the last 30 years, launches the guest contributor page with a highly personal introduction to this remarkable body of work. Martin Saving, the Elias viola player, has launched the blog page with How Fast Shall We Play?, a considered view on the controversial subject of tempi and the metronome. From 2012 the Elias String Quartet will begin performances of the complete Beethoven Quartets cycle at venues across the UK including Brighton, Southampton and Tonbridge, culminating in London for the 2014/15 season. In the meantime, forthcoming Elias String Quartet concerts featuring some of the early and middle period Beethoven works within recital programmes include London’s Wigmore Hall on 19 April, venues in Barnsley, Doncaster, Liverpool, Portsmouth and Whitehaven throughout May and June and the East Neuk Festival 2 and 3 July. 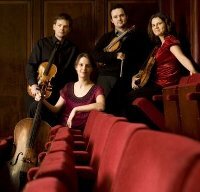 Beethoven’s later quartets also feature in the 2011/12 season including Wigmore Hall and a Scottish tour.